Last week for Colorado Lady’s Vintage Thingie Thursday I showed you my vintage postcard collection. Today I’m making good on my promise/threat and showing you my needle book collection. I’ll show you all three at once though instead of dragging it out for three days since there isn’t a lot of things to say about them – it’s mainly eye candy. I just love the graphics on these things. They remind me of my vintage postcards. 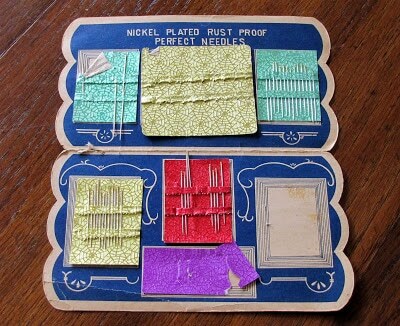 I found this one in my mother’s sewing machine cabinet and it started my quest for other needle books. These women helping each other sew cracks me up. I don’t think I have ever sewn with a group of people. 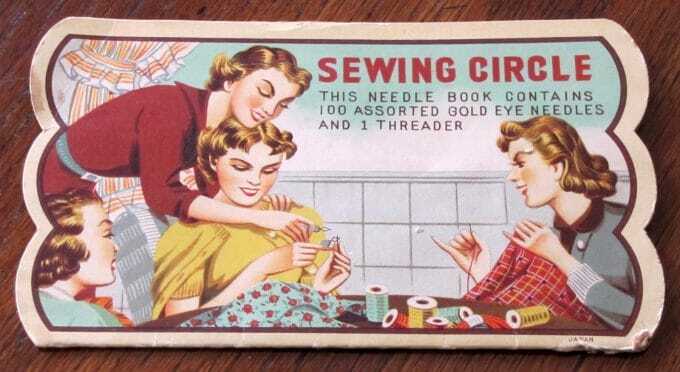 OK, I know I have never sewn with a group of people. I guess times were different then. 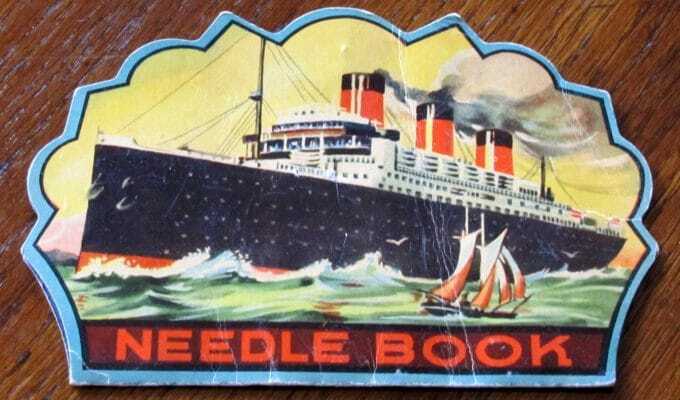 Needle books held different sized needles along with a needle threader thingie. 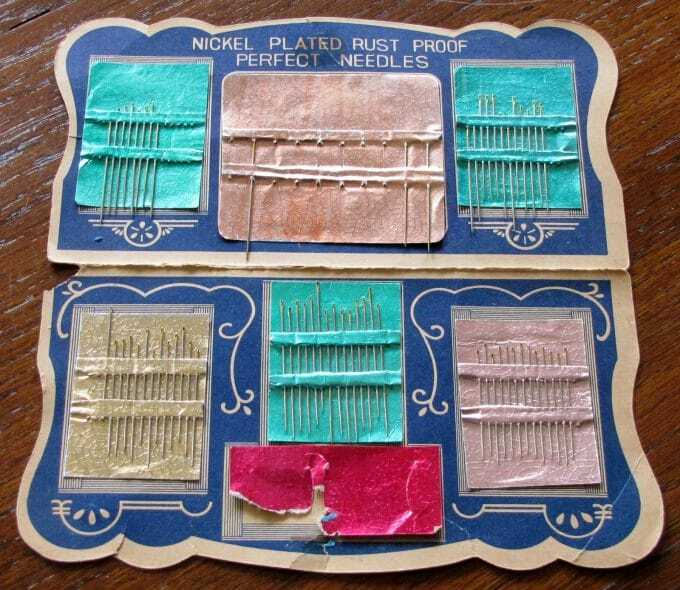 I thought that maybe there was a technical name for the needle threader, so I Googled it, but alas that is really the name. I bought the next two booklets at a garage sale this year. I think I only paid a dollar for each. a boat on the other. 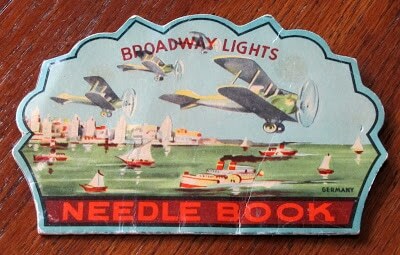 Airplanes and boats seem like a strange marketing design for selling needles though. My theory is that maybe they thought airplanes go fast and boats glide through the water so therefore the needles will slide through the fabric quickly and easily??? Or maybe it’s because you could take these books on a trip with you? Not a lot of needles left, but it does have the needle threader thing. 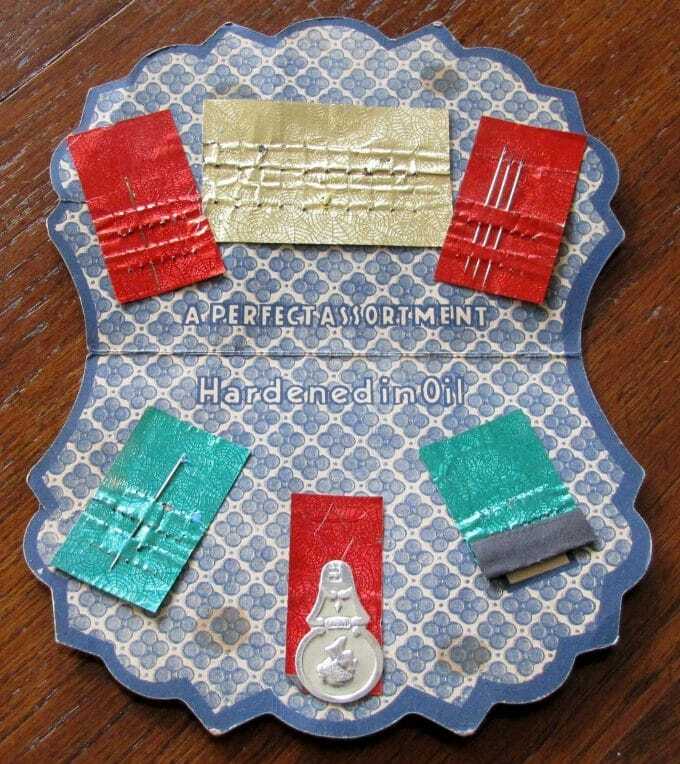 And the needles were hardened in oil, whatever that’s supposed to mean. Doesn’t this one have awesome space age graphics? 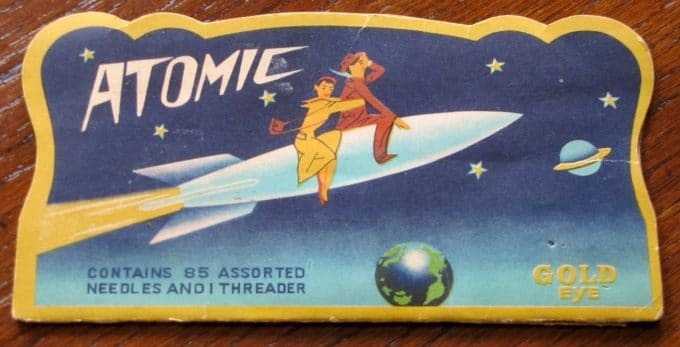 Again, not sure what rockets have to do with needles, but I love the guy and his gal sitting on the rocket with her handbag flying behind her. It’s so 1940’s. This one had quite a few needles left. Not that I would ever use them because these books are normally framed and hanging in my family room. If I ever have a freak needle crisis I guess I could unframe them again. 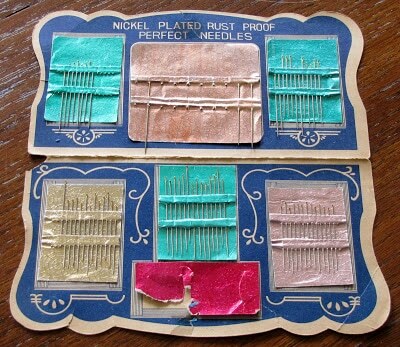 Hope you enjoyed my vintage needle books. 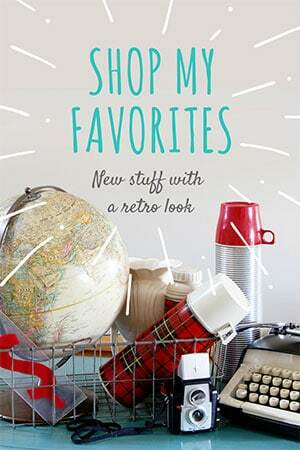 Check out Colorado Lady’s blog to see some other cute vintage items. Previous Post: « It’s Corn On The Cob Time!!! 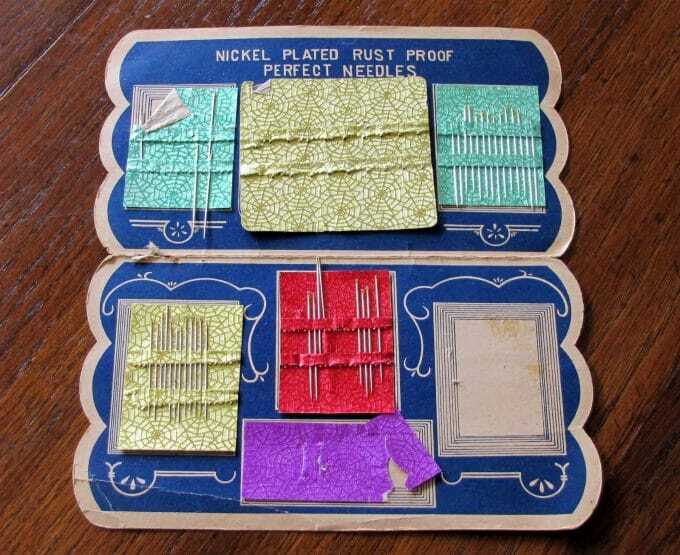 Those bring back memories-I have a couple of these stashed with my sewing stuff-they were in my grandmother’s sewing cabinet. How fun that you have a collection of them! Love your posting! I started laughing out loud over your comment about the eyebrows!! ROFL!! 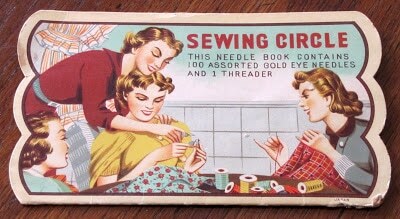 My mother-in-law belonged to a sewing club. 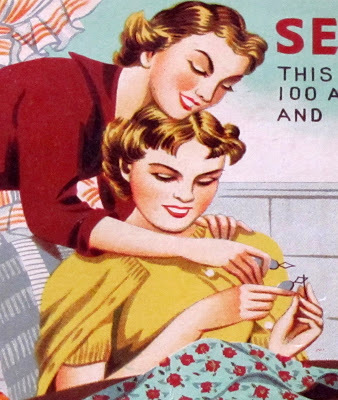 I think all of the women started out with needles projects, but as the years passed, it was just a gab session. They enjoyed it and met every Friday afternoon for 40+ years. 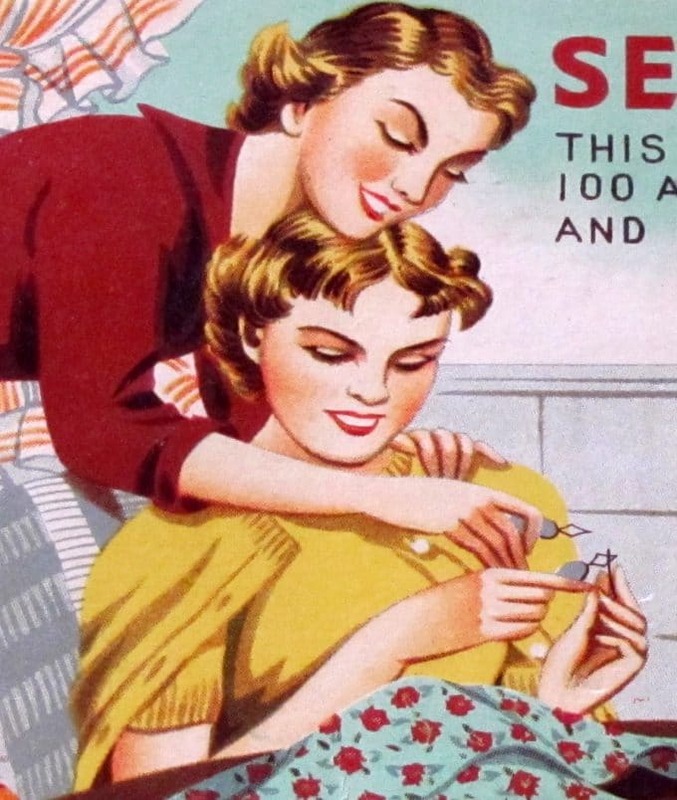 Can’t imagine trying to thread a needle without a Sewing Betty. Thank you, Betty!! What a nice collection. I beleive a lot of these were given out my companies and stores as a free gift. Maybe the airplane and boat one was something that was in their rooms on boats and the airplane one might have been in a packet for airplane trips. I have seen some that have advertisements on them for banks and grocery stores. Somewhere I saw an article about them. Thanks for sharing. Awesome collection. 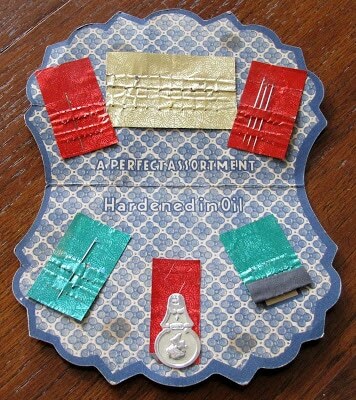 Love the artwork… makes doing needlework fun! 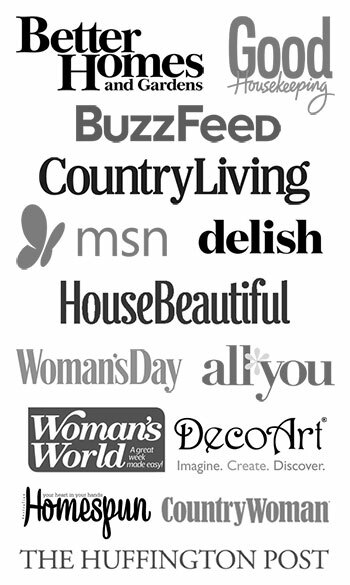 These are wonderful finds! What a great collection you have! What a funny post! 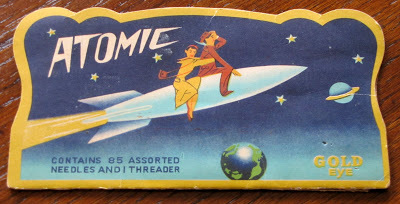 I can’t imagine why a rocket would be on the package. Unless everybody then were drawn to anything with rockets on it. But of course, you’ll want to bring them on your cruise, in case a button pops off while playing shuffle board. lol. Thanks for sharing. 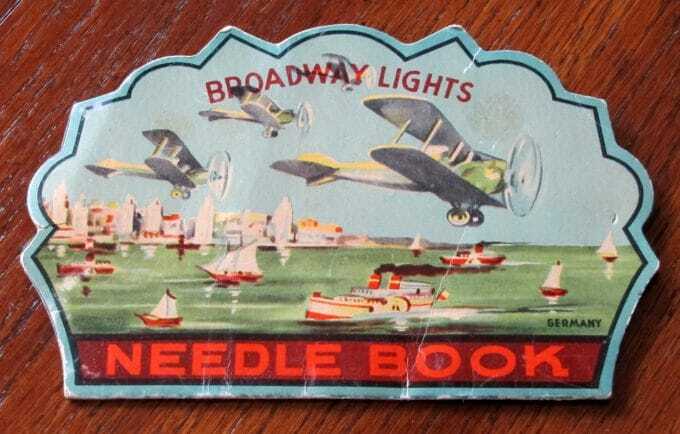 I like the graphics on the needle books. They put so many needles in most of those that most people would never use them up in a lifetime. I have one or two like yours. Some of the ones you shared, I have not seen before. You have a nice collection. Yours are very nice1 Thank you for sharing! You crack me up! Good ‘color commentary’! I have one very similar to the eyebrow discussion card but not exactly the same. Would this not be called a sewing bee? I don’t really know! Terrific post! 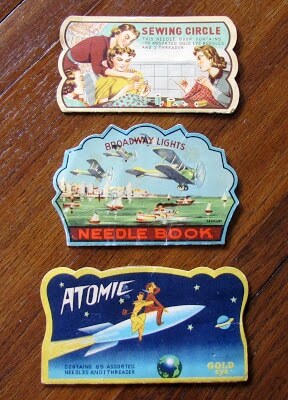 I have never seen an Atomic needle book before…really terrific! What a wonderful thing to collect! Since I’m a sewer, I think I’ll be keeping my eye out for a couple of these. Thank you for sharing. What a neat collection. Love the commentary as well! Thanks for sharing it! Great collection. I love all the needle books….they are great! My favorite is the Atomic needle book. Happy “late” VTT! Neat collection and funnt comments! Thanks for sharing!